the gameplay of each individual contestant, sifting through webclips, post-boot interviews and all other available information to find out the current strategies in play. Spoilers have no place here as this isn’t about predicting outcomes (though speculation is inevitable). Mostly, I’m trying to answer why things are happening—and to celebrate all the different ways this game can be played. To be fair, we didn’t even get this completely right, since we thought Galang’s vote would be between Colton and Candice (with Rupert as an outside possibility). None of us thought Laura Morett would be in the mix, and Colton didn’t get a single vote! Obviously, I’m discounting the throwaway vote for Gervase. Aras revealed in a pregame interview with Gordon Holmes that he has a longstanding friendship with Gervase—one he doesn’t think anybody else knows about. That made it easy enough for him to throw the vote at Gervase with the Redskins excuse and know that Gervase would not be bothered by it. It’s a savvy move, but one so transparent that I expect most of his tribemates were privately rolling their eyes at him for dodging the bullet they manned up and took. Because of Aras’ laid back nature, I think he’ll reap the benefits he hoped for, but other players could have found such a move held against them. So why did Laura get the votes over Colton? Well, I have my suspicions that this comes down to the curse of all mass-returner seasons: pre-game alliances. No player admits to having made them, but after seeing Heroes vs. Villains (particularly the Heroes tribe), you would be a fool not to. To Entertainment Weekly, Colton said that he would be interested in making an alliance with Monica: nobody has ever come back and worked with the person that voted them out, so nobody would expect them to be aligned. (I hesitate to correct the winner of Survivor Jeopardy but what about Amanda and James?) Monica and Brad brought up the exact same theory with Gordon Holmes. Despite their coy condition of “If they’re up for it…” I suspect they might just have discussed this plan in advance. Whether or not the third One Worlder, Kat, is also in this putative alliance is anybody’s guess, but Colton at least has that connection, plus his infamy means that he has probably interacted with a number of the more socially active Survivors in the year since he played. Laura Morett is here on her own from Samoa which was eight seasons and four years ago—I don’t know what sort of presence she has on the Survivor circuit, but she’s out of the way in Oregon and old news. (She seemed to be the only returning player this season that Kim Spradlin had neither met nor knew much about.) Is it possible that Laura made the mistake of not pestering people for alliances pre-game? Or did she just lack the connections to make them stick? The older woman tag was almost certainly Laura Boneham’s downfall, despite Rupert’s suggestion that Tadhana fears his own prowess in the game. She was even less prepared for it than Candice—both Dalton Ross and Gordon Holmes, who were present for this game opening, noted that she let the expletives fly—which suggests that while she is more grounded than Rupert, she still has a different grasp on reality than most of us. Thus we were given the perfect set up for the next twist, when Rupert took her place on Redemption Island at the first opportunity (and Candice most likely died a little inside.) That was also entirely predictable: the real question was would John switch with Candice? The Bonehams had set a very melodramatic precedent that you don’t leave the love of your life stranded on Redemption Island, and I expected that either Candice would insist that she stayed or John would feel obliged to swap. Neither happened, as Candice appeared to leave the decision up to John who chose to stay with his tribe. Good call. John had a better chance of fitting in with his new tribe than Candice did, and Candice might actually be better qualified than John to last at Redemption Island, seeing as she’s had plenty of challenge experience and proven herself to be a decent all-rounder. The Redemption Island precedent is for one person to battle through every duel, and of the initial three boots, Candice seems to be the most likely contender for that position. Still, challenges being as random as they are, there is no guarantee she’s long for our screens. John might yet switch with her, but odds are against this pair reaching the merge intact. So instead of playing the game, Candice and Rupert get to hang out with each other at Redemption Island. This could have been a chance to work out their differences from Heroes vs. Villains, but Rupert decided to opt for the strategy of spending his entire time resting up for the challenges (and most likely rehearsing dramatic monologues for the duel.) Fair enough; even if Candice figures out what he’s doing, there’s not much she can do to combat it. She might not cook meals for him after the first day, but if she makes a fire for herself, she makes it for Rupert. Any food she gathers will have to be hidden or guarded if she doesn’t want him to share it. All in all, Candice is probably remembering Exile Island’s lonely sandbar very fondly right now. This is the fate to which John has abandoned his wife. Nothing wrong with John’s decision. However, before this season started, one of the big questions we raised in our discussion of NuDemption Island was how the players would view somebody who did not save their loved one. With Tadhana’s acceptance of John, it seems we have our answer. There are some mitigating factors: the tribe was probably highly relieved not to lose one of their young athletic guys right off the bat, and Candice is arguably the best prepared player out there for Redemption Island conditions. It is entirely possible that people disapproved of it in private confessionals, but it has not been a dealbreaker in making alliances. More importantly, the tone has been set for the rest of the players. John’s decision may well have been crucial in defining the course of the game—how hard would it have been for somebody to leave their loved one had Rupert and John both switched? John’s position and Candice’s raises an interesting scenario. If Candice were to return to the game, the obvious plan would be for her to join John’s alliance. At some point down the road, will John get the blessing of his allies to take her place, so that they can fill her in on their strategy and get to know her? They’d be losing one of their strong guys for an immunity challenge unseen, but Candice is no mean addition to a challenge line-up. She could fill in for three days, then go back to Redemption Island with a post-merge deal in place. Candice (or John) might not last that long, but the same situation could come up with another person on Redemption once the players start getting antsy about the merge. —it seems John and Candice were right when they said he had a knack for making people like him. Brad’s wife Monica was on the outside of a day one alliance and never recovered. Brad told us that he was following her advice to forge one right away. (I like to think of her coaching him: “Count on your fingers, honey: five – in; four – out.”) He’s also setting about their pre-game strategy of gathering the muscle together to stop the “John Cochrans” and the “weak women” winning again. Brad is not nor never likely to be a Survivor Jeopardy champion, and so I have no qualms in pointing out that Denise, Kim and Sophie were all strong in challenges: we have to go all the way back to Sandra, in Heroes vs. Villains to find a physically weak female winner. Four years ago is not a current trend! At any rate, with the five guys locked up, it only remained to send one of the girls home, and Gervase sealed Marissa’s fate. I’m always sorry for the first boot (well, third, technically) but I don’t think I’ve ever been more sorry than for Marissa. It’s an act of unbelievable pettiness to take their anger at Gervase out on his niece, and when you factor in her age as well (at twenty-one, she’s the youngest player this season), it’s tantamount to bullying. Compare that to Katie who seems unlikely to have handled the physical portion any better than the puzzle portion, and it is madness to take Marissa out. If they all chose to vote her off because of Gervase, then that entire tribe is failing at Survivor. Katie’s challenge performance not the worst, historically. Yet I never assume players are being stupid. The episode might have only shown us Brad’s alliance, but are we to believe that all the women sat around and waited to be told who to vote for, especially when the men’s alliance was so obvious? Katie’s challenge performance was not nearly as bad as Chris’ in Vanuatu; still, historically, if somebody is responsible for the first challenge loss and does not get voted out, then that person is in an alliance. In her online video, Tina explains that she has told Katie she will stay loyal to her until the merge but then it’s every man for himself. Thus tipped off, Katie explains her own twofold gameplan which involves making use of her mother’s connections, but balancing that with an alliance of loved ones wanting an individual strategy. Vytas, who Tina and Katie wanted to work with anyway and who is here with his brother rather than his lover, seems like a reasonable candidate for this hypothetical alliance. Vytas has also demonstrated the same theoretical bent for strategy as Katie and actually specifies in his online video that he likes female energy. I’m not going to talk much about what Vytas is doing, since I think it was fairly self-evident in episode, but if you have been touched by his backstory, make sure you watch his pre-game recounting of his heroin addiction, and Aras’ account of the impact it had on their family. Bleak, but deeply moving. An even more obvious candidate for Katie’s plan is John who has no choice but to work as a single player. John readily accepted Brad’s offer, but he sounded too cynical about the alliance to make me believe he’d be opposed to other options. The Entertainment Weekly deleted scene shows Katie and Rachel sympathizing with him over losing his wife, and in Survivor we should always assume an ulterior motive. Even if he doesn’t mesh with Katie, he has a connection with Rachel—if there was a Heroes vs. Villains pre-game alliance, these two would be in on it, but even if there wasn’t, they should have met at the reunion for that season. That’s a big deal in a tribe of strangers, and they also have common ground in that both of them watched their partners’ original seasons in the early stages of their relationships. In the EW scene, Rachel had followed John and Katie on their trek to the well, which is a good sign that she’s keeping an eye on what’s going on. She also got some alone-time with Brad on the way to Treemail and had Vytas bringing her word on the vote. (Pre-game, she was cautiously interested in the Brothers Baskauskas as allies.) Rachel looked to be perpetually on the brink of tears this episode, which was something she, Tyson and Jeff Probst were worried about going into the season, but she hasn’t earned the SurvivorBreakdown hashtag yet, she seems to be making connections, and I’m starting to feel more confident about her chances in general. The same applies to Ciera, who I had grave doubts about. Ciera has not only survived the separation from her mother, but she’s pitching in, opening up to people and showing a lot of enthusiasm about the game. Furthermore, she’s capable of smart and dirty moves: she left her husband to potty train their toddler while she was gone. I take it all back and am looking forward to see what Ciera is going to bring to the table. Hayden might be in on the One World alliance too, but his previous success with the Brigade should predispose him to sticking with the men—or not. He often seemed to be absent when they were actually talking strategy. Oh, let’s just get it out there that I have never watched Big Brother and have no read on Hayden. Feel free to enlighten me in the comments. My hope is that Katie is already part of a majority alliance that overlaps with Brad’s all-male one, and we just haven’t seen it in the name of preserving suspense for the vote. Still even if I’m wrong, it looks like John and Vytas (at least) already have female friends who they could be willing to protect. If the women are smart, they’ll urge them to turn on one of the other men, rather than being satisfied with ducking the vote. A potential line of argument could be that Brad and Caleb are only reliable as long as Monica and Colton are not on Redemption Island. It’s hard to see either of those men not stepping in to save their spouse. Caleb has acknowledged that it’s Colton’s dream to win, not his; Brad, obviously, already talked about helping Monica over his own tribe. But where did Marissa fall into this mix? It’s impossible to be sure, but one potential clue comes from her own intended strategy: to stay invisible and not draw attention to herself. She was trusting in her challenge ability and work ethic to keep her off the block for the first vote or two. It’s a solid enough theory and is probably pretty much what Caleb and Hayden are doing. The problem Marissa has is that nobody was interested in her—partly because nobody was there from her demographic. I’m not sure how much her ethnicity played into that, but I do think her age was a big factor. She is twenty-one and just graduated from college; on most tribes/seasons, she’d have two or three other people at similar points of their lives. On this tribe, Ciera is the closest to her age, but Ciera’s married with two small children and going back to school. Katie, at twenty-five and only recently established in her career, might be a more obvious match, but Katie tried to vote Marissa off at the start of the game. That’s another red flag right there. Why would Katie, who wants to find loved ones willing to fly solo, turn on the girl with the most distant relationship to her partner? For that matter, why did Laura Boneham pick on her? For all we know, John and Rachel might have voted for Marissa too, if they were banking on a met-at-Heroes-vs.-Villains-reunion alliance with Laura. (In a similar vein, Katie’s mother is another of Rupert’s former tribemates.) The other non-Laura vote came from Marissa herself, who latched onto Brad after his remark about throwing a challenge—and I’m sure that played a factor into his willingness to vote her off! One of the things Rupert and Laura mentioned in their pre-game interviews was how scared Marissa looked (along with Rachel). That wasn’t something we saw at all in Marissa’s pregame interviews—especially with her uncle, she came over as bubbly and excited, but before the immunity challenge, she was hyperventilating, and she certainly looked nervous at Tribal Council. Marissa might have made other friends. Perhaps she even had a few deals with people. But my belief is the tribe thought they were voting off a girl who was too scared to be out here anyway. Since I am a big fan of Marissa, I’m really disappointed, and her nerves do not bode well for the first Redemption Island challenge. At least I can look forward to one last, memorable Gervase-Marissa exchange, as she points out to him that it’s his fault she is there, so the only honorable thing to do would be to take her place. Tina, one of the older women to save the day. Among the many things to be shocked by in the first episode was Galang’s challenge performance. Yes, they won, as the older women went against the prevailing view and saved the day, but their performance in the physical portion was an absolute disgrace for veterans. At any rate, that might have been the most unexpectedly disastrous challenge performance since Crystal Cox started running in Gabon, and it does raise my concern levels for Galang in the future. Aras, Tyson and Laura Morett all have experience on challenge dominant tribes: they need to start channeling whatever it was that Casaya, Timbira and Galu were doing so right. This is actually good news for Laura Boneham, who pulled Rupert’s weight in the challenge when she took up the slack left by other male players. While Colton and Gervase were lagging behind the rest of the swimmers, she was helping people over the obstacles and diving down to untie knots. She was the only person to notice that Aras had been left on the other side of the roller. Overall, she contributed a lot more than Gervase, Colton, or Kat, and Galang might want to think twice before getting rid of her. I’m going against the rest of the RHAP family in this, but I think Laura’s got at least as good a shot on Galang as Rupert. She might not have provided the brute strength they wanted while building the shelter, but she brings his straightforward, predictable game without his camera-hogging baggage. I’m not sure how her social game will be, but she took the right tack in immediately setting to work and asking the veterans around her for advice. Moreover, rather than being the only older woman on Tadhana, she’s now one of four women over forty on Galang. I haven’t fact-checked, but I’m fairly sure the only other time we’ve seen that many older women on one tribe was Nicaragua with its young vs. old theme. All these Galang women have daughters, Monica knows what it’s like to live in the shadow of a famous husband, and Laura should have at least met Tina before! It’s not necessarily an alliance, but Laura has got a great chance of making friends, and that’s a start. As far as an alliance goes, Laura is single and inexperienced. She’s the perfect person to tuck under a returner’s wing and be made a loyal vote. I really don’t see a reason to vote her off. Unless you’re Gervase, who reportedly had a run in with her over her Marissa vote. 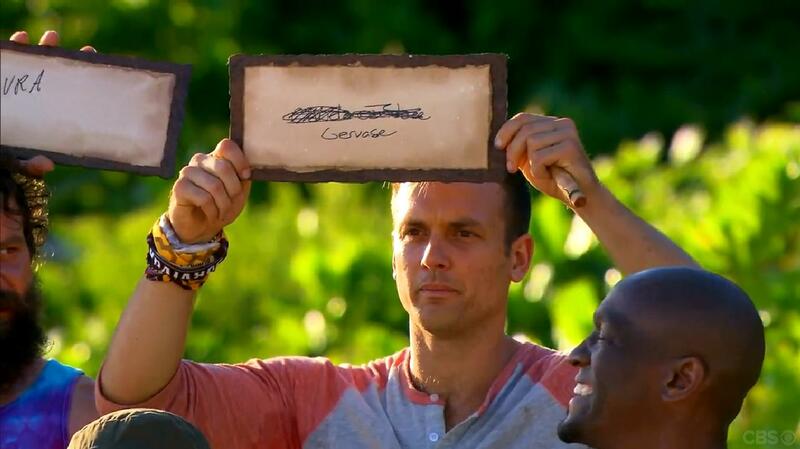 Of course, after last week’s challenge, the tribe might choose Laura over Gervase. Honestly, I wouldn’t bet on either being in trouble. Gervase, as I said above, had a pre-game friendship with Aras anyway, and both of them were interested in aligning with Tina. Tina said she was happy to see Gervase and planning to align with Aras, and then just about everybody else said they wanted to align with Tina and/or Aras. I think we’ve found the hub for our majority. But it’s tricky to define who that majority is, based on what we’ve seen. The other person Tina mentioned getting together with is Monica, and if there is one person we can expect to lock in an alliance of five, it’s Monica. While Tina and half of the tribe were distracted by Rupert’s exchange with Laura, Monica was muttering to Aras and Gervase on one end of the group. Considering the social games of Tina, Aras and Gervase, I would expect these three to be happy leaving Monica as the official leader of the alliance, but just as with her husband’s allies, I would not be surprised if there are plenty of secondary deals going on. Following the pre-game intentions trail, we come up against the fact that Monica and Brad planned on gathering the muscle together, so we have to assume that Monica’s alliance will include Tyson. I’ve already theorized that the returners from Heroes vs. Villains might have been interested in playing with each other, but considering Tyson never shared a tribe nor even a Ponderosa with Candice and Rupert, I doubt that was anything more than a backup plan for him. His intention was to align with the Pirates Boneham and the Brothers Baskauskas, so half of his choices are available to him. On the downside, Tina was wary of him pre-game, and his vote for Laura Morett might have burned a bridge there. He’s vital to his tribe right now, but I don’t see him in a core alliance. Finally, there’s my suspicion that Colton and Monica had a pre-game agreement. The fact that Monica is so worried if she can trust him means that they’ve got some pact going on, but Colton would be an odd choice for a muscle-alliance. Has he been inducted into the majority anyway, or does Monica view him as a secret vote in her pocket? Colton himself seems to be making the same emotional adjustment to the game that he needed last time, and I’m guessing he has not made any active moves yet. Still, he has always prided himself on his aggressive game, so I expect him to come out guns blazing either this week or next. Will Colton be satisfied with a behind the throne position this time, or will he feel the need to challenge a figurehead authority, even if she’s his own ally? This leaves us with the loose ends of Kat and Laura Morett. Laura got an early tip off that she had a target, though luckily two of the three votes for her went to Redemption Island. She was right in front of Monica’s discussion with Aras and Gervase, so Monica shouldn’t have said anything she didn’t want Laura to overhear or feel excluded by. That could mean that the discussion was trivial, or it could mean that Monica wants to work with Laura. Add in a good puzzle performance (it’s not clear who deserves the main credit for that puzzle success, but it’s always better to be part of the surprise victory portion of the challenge than the total embarrassment one), and I think there is plenty of hope for Laura. But it is dependent on whether she can play a very different social game to last time. Worming your way into the good graces of a tribe requires a different skillset to leading a clique. Laura’s dearth of scenes in camp probably frustrates me more than anybody else’s. And then there’s Kat who has a One World connection that Kim Spradlin thinks will fail. Two decades younger than the other women on her tribe, twenty-three year old Kat will not find a girls’ alliance to be a solution this time. It is also difficult to see how she’ll fit in with the guys. Colton is a year younger than her, but they bicker and the next youngest member of her tribe is Aras at thirty-one. None of this means that she will not get into an alliance or be viewed as a good pawn, but what I worry most about with Kat is how much she will enjoy this game compared to her last. She always felt safe and secure last time, and I doubt that will be the case this time… Time will tell if that has any effect on her gameplay. Vytas already showing his bond with Aras is more than a bromance. The pre-intro sequence felt very Amazing Race-like in its set up, and I don’t think I have ever fully appreciated before just how much The Amazing Race benefits from its pre-established dynamics. Long-term relationships give us more emotional weight than we typically expect from Survivor. The Aras/Vytas and Candice/John storylines are already more compelling than the standard bromantic and showmantic fare, and half the cast are still to be explored. I’m not sure how this will hold up as the pairs are whittled down, but I’m already far more invested in these players than I would be otherwise. That’s it for this episode. The next one will provide us with a post-boot interview and more in-game secret scenes, so I’ll be back next week with a (most likely heavily-) revised version of my theories. See you then.